A delegation from Al Falah University, headed by Dr. Samir Barghouthi, Vice President for Academic Affairs visited the Dubai Judicial Institute on Tuesday to discuss various modes of cooperation between the parties in the coming period and how our students will benefit from such endeavor. Dr. Jamal Sumaiti, Director General of the Institute headed the Dubai Institute of Justice and warmly welcomed our delegation, which included Dr. Samir Barghouthi and Ms. Ghada Walid, Student Affairs Manager. Dr. Jamal provided a detailed review of the role of the Dubai Judicial Institute in order to increase the efficiency of the trainees and the accuracy of their trainings as well as to improve the internal environment and optimal utilization of resources. Dr. Samir Barghouthi gave a detailed overview of the university and its future plans. He also highlighted how Al Falah University plays a vital role in the interaction with the community. 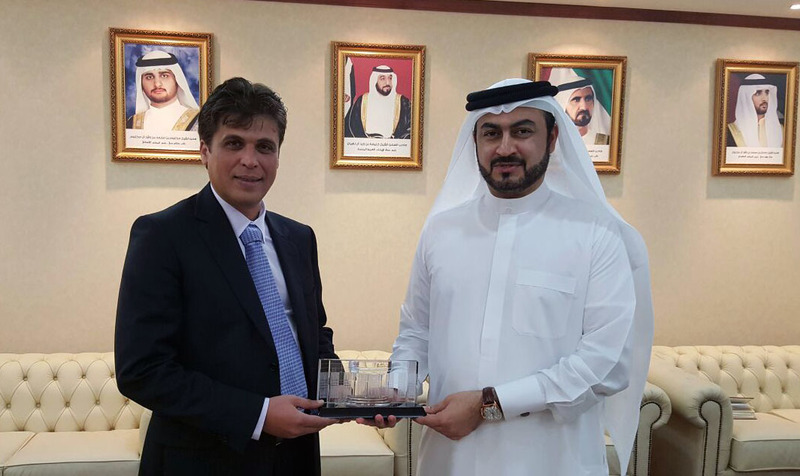 The delegation also praised the reputation of the Dubai Judicial Institute and their experience in the field of judicial training. Dr. Sameer expressed the desire of the University to establish judicial cooperation and take advantage of existing expertise by providing them to the students of the Faculty of Law. The Vice President of Academic Affairs, Dr. Sameer Barghouthi was presented by the Institute’s shield as a token of appreciation and cooperation by Dr. Jamal Sumaiti.